BOAT OWNER'S NOTES for 1990 MURPHY Concord Flybridge in EXCELLENT & BEAUTIFUL condition and stored in a heated showroom , c all owner Jerry @ 407-970-4265. OVERVIEW: T urbo charged intercooled engine, this is a boat that you Must See (only 2 were ever made and this is boat #2 and the boat Must Go, A ll fiberglass hull with wood liner (hull is smooth planked Honduras mahogany), This boat comes equipped with a galvanized dual axle roller bunk trailer with electric winch, spare tire and bracket & electric brakes and is located in Racine, Wisconsin. 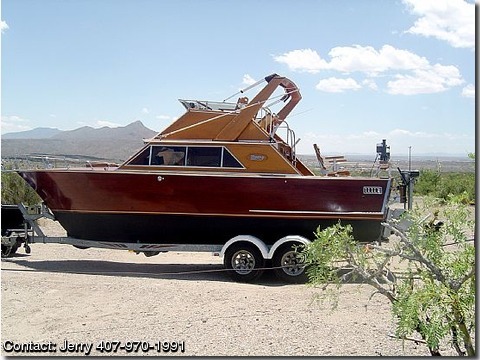 FEATURES & EQUIPMENT: C hrome deck mounted anchor, bow pulpit with extended rails, bow rails, rope locker forward, pressure water system, flybridge weather cover, wood inlaid cockpit sole, 64 gal fuel, 40 gal fresh wate r , 110 volt shore power, rope locker forward, dual bilge blowers, full mooring cover, wood radar arch, great lake fishing package, epoxy glass cloth below water line, self draining cockpit, all windows with screens and blinds, AM/FM stereo. MISCELLANEOUS EQUIPMENT: Copper and bronze fastenings throughout, boot stripe, chrome deck mounted anchor, square rope bit with integral rope pipe, convertible top, seacock or drain plug, carpeted cabin, safety glass windshield, dual bilge blowers , flag with staff, boarding steps, rear view mirror, 2 electrical cannon downriggers, aux illiary heater, fireboy halon fire system, washdown system with pump (never used), full shipping cover (ALL boat covers still in original wrapping), has full foam package, livewell , a erated (bait), rigging station (bait). ENGINE/POWER: P ower stern drive, duro prop, turbo charged intercooled, fresh water cooling with motor box, Total time on motor since new = 94.6, B ritish seagull model kingfisher 6hp trolling motor (never used). ELECTRONICS: D ual 120 ICOM VHF radio with dual antennas, backlit instrument panel in walnut, 800 raytheon fishfinder, 820 raytheon fishfinder & plotter, dual full control stations with complete instruments, spotlight with remote control, international rules navigation lights, air horns, dual battery with main switch charger & isolator, 110v dockside electric cable, full engine instruments plus clock, tachometer, hour meter, trim gauge, rudder indicator, power steering, dual bilge pumps, dual electric self parking windshield wipers. GALLEY: Full galley (never used) equipped with stove, sink and refrigerator. HEAD: Fully enclosed with e nclosed porta potti (never used) with sink, vanity and wash bowl. NOTES No damage history, never stored in the water. If further information is desired please feel free to contact me at any time call me (Jerry) @ 407-970-4265.